Essential skills are the foundation skills we need to succeed at work and in life. Essential skills are used in every job to varying degrees and at different levels of complexity. They provide the foundation for learning all other skills and enable people to evolve with their jobs and adapt to workplace change. Most adult Canadians have these skills, but many people do not have skills at the level they need. Some essential skills are not taught at school. For example, few people learn how to use technical drawings at school, but it’s an essential skill that many people use at work. The skills we learn in school are not necessarily the skills we use for work. For example, we learn to write poetry in school but few of us use those skills at work. If we don’t use the skills we learn, we lose them. Math is a good example. When most of us graduate high school, our math skills are good, but we quickly forget how to calculate angles or divide fractions if we don’t use these skills. Why are Essential Skills Important? More employable… They find work 29 weeks faster than people with poor essential skills. Wealthier… They earn more money. 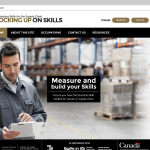 In Canada, about 28 percent of what we earn is directly related to our level of essential skills. Nothing else – not even education and experience – contributes as much to income. More productive… They make fewer mistakes and better decisions. Safer… They are less likely to injure themselves or others on the job. Faster learners… They learn technical skills for work, like how to operate equipment, faster. Better at adapting to change… They apply what they’ve learned in the past to new situations and need less retraining.